REEL BLUE AQUA SEALER replaces REEL Matte Sealer and REEL Prosthetic Sealer. REEL BLUE AQUA SEALER is a water based cosmetic sealer for all of your make up sealing requirements such as sealing REEL BODY ART INKS, make up, prosthetics, etc. A light spray is usually all that is necessary. 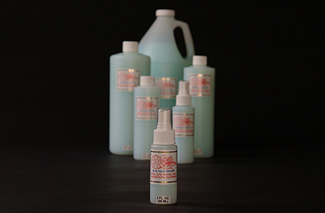 REEL WHISKER FIXER was formulated to replace Krylon. It is a water based, cosmetic, non-toxic topical spray which is designed as a beard spray. When dry, it is water proof and oil resistant. Great for making beards on a beard block and floating off with REEL Developer.